In a stunning turn of events, President Obama announced last weekend that “unnecessary testing” is “consuming too much instructional time” and creating “undue stress for educators and students.” Rarely has a president so thoroughly repudiated such a defining aspect of his own public education policy. In a three-minute video announcing this reversal, Obama cracks jokes about how silly it is to over-test students, and recalls that the teachers who had the most influence on his life were not the ones who prepared him best for his standardized tests. Perhaps Obama hopes we will forget it was his own Education Secretary, Arne Duncan, who radically reorganized America’s education system around the almighty test score. Obama’s statement comes in the wake of yet another study revealing the overwhelming number of standardized tests children are forced to take: The average student today is subjected to 112 standardized tests between preschool and high school graduation. Because it’s what we have rewarded and required, America’s education system has become completely fixated on how well students perform on tests. Further, the highest concentration of these tests are in schools serving low-income students and students of color. To be sure, Obama isn’t the only president to menace the education system with high-stakes exams. This thoroughly bi-partisan project was enabled by George W. Bush’s No Child Left Behind Act. NCLB became law in 2002 with overwhelming support from Republicans and Democrats alike. Obama, instead of erasing the wrong answer choice of NCLB’s test-and-punish policy, decided to press ahead. Like a student filling in her entire Scantron sheet with answer choice “D,” Duncan’s erroneous Race to the Top initiative was the incorrect solution for students. It did, however, make four corporations rich by assigning their tests as the law of the land. Desperate school districts, ravaged by the Great Recession, eagerly sought Race to the Top points by promulgating more and more tests. [RttT] will make the current standardized tests of basic skills more important than ever, and even more time and resources will be devoted to raising scores on these tests. The curriculum will be narrowed even more than under George W. Bush’s No Child Left Behind, because of the link between wages and scores. There will be even less time available for the arts, science, history, civics, foreign language, even physical education. Teachers will teach to the test. What Ravitch warned us about has come to pass, and Obama has now admitted as much without fully admitting to his direct role in promoting the tests. Duncan and Obama, with funding from the Gates Foundation, coupled Race to the Top with Common Core State Standards and the high-stakes tests that came shrink wrapped with them. Together these policies have orchestrated a radical seizure of power by what I call the “testocracy”—The multibillion dollar testing corporations, the billionaire philanthropists who promote their policies, and the politicians who write their policies into law. These policies in turn have produced the largest uprising against high-stakes testing in U.S. history. To give you just a few highlights of the size and scope of this unprecedented struggle, students have staged walkouts of the tests in Portland, Chicago, Colorado, New Mexico, and beyond. Teachers from Seattle to Toledo to New York City have refused to administer the tests. And the parent movement to opt children out of tests has exploded into a mass social movement, including some 60,000 families in Washington State and more than 200,000 families in New York State. One of the sparks that helped ignite this uprising occurred at Garfield High School, where I teach, when the entire faculty voted unanimously to refuse to administer the Measures of Academic Progress (MAP) test. The boycott spread to several other schools in Seattle and then the superintendent threatened my colleagues with a ten-day suspension without pay. Because of the unanimous vote of the student government and the PTA in support of the boycott—and the solidarity we received from around the country—the superintendent backed off his threat and canceled the MAP test altogether at the high school level. Can you imagine the vindication that my colleagues feel today—after having risked their jobs to reduce testing—from hearing the president acknowledge there is too much testing in the schools? And it should be clear that this national uprising, this Education Spring, has forced the testocracy to retreat and is the reason that the Obama administration has come to its current understanding on testing in schools. However, the testocracy, having amassed so much power and wealth, won’t just slink quietly into the night. A Facebook video from Obama isn’t going to convince the Pearson corporation to give up its $9 billion in corporate profits from testing and textbooks. The tangle of tests promulgated by the federal government is now embedded at state and district levels. More importantly, the President exposed just how halfhearted his change of heart was by declaring he will not reduce the current federal requirement to annually test all students in grades 3 through 8 in math and reading, with high school students still tested at least once. A reauthorization of NCLB is in the works right now, and all versions preserve these harmful testing mandates. As well, Obama’s call to reduce testing to 2% of the school year still requires students to take standardized tests for an outlandish twenty-four hours. And it isn’t even all the time directly spent taking the tests that’s the biggest problem. The real shame, which Obama never addressed, is that as long as there are high-stakes attached to the standardized tests, test prep activities will continue to dominate instructional time. As long as the testocracy continues to demand that students’ graduation and teachers’ evaluation or pay are determined by these tests, test prep will continue to crowed out all the things that educators know are vital to teaching the whole child—critical thinking, imagination, the arts, recess, collaboration, problem based learning, and more. Yes, let’s all be honest with ourselves. Honesty would require acknowledgement that standardized test scores primarily demonstrate a student’s family income level, not how well a teacher has coached how to fill in bubbles. Honesty would dictate that we recognize that the biggest obstacle to the success of our students is that politicians are not being held accountable for the fact that nearly half children in the public schools now live in poverty. As Congress debates the new iteration of federal education policy, they should focus on supporting programs to uplift disadvantaged children and leave the assessment policy to local educators. They have proven they don’t understand how to best assess our students and now they have admitted as much. It’s time to listen to those of us who have advocated for an end to the practice endlessly ranking and sorting our youth with high-stakes tests. It’s time Congress repeal the requirement of standardized tests at every grade level. It’s time to end the reign of the testocracy and allow parents, students, and educators to implement authentic assessments designed to help support student learning and nurture the whole child. 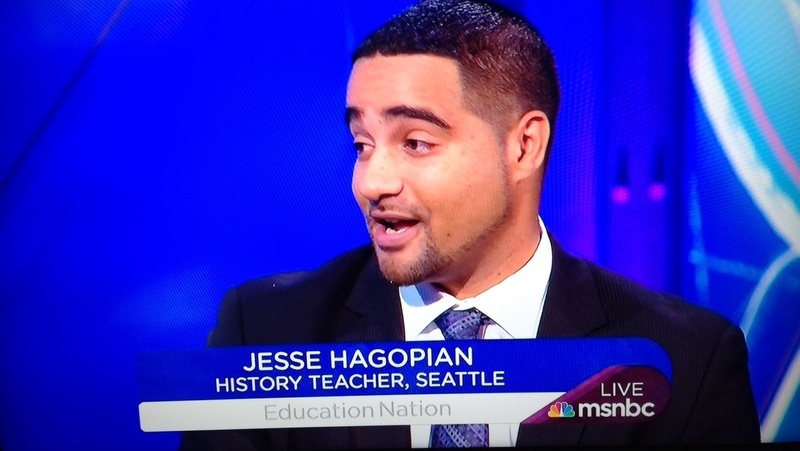 Jesse Hagopian is an associate editor for Rethinking Schools magazine and teaches history at Garfield High School. Jesse is the editor of the book, More Than a Score: The New Uprising Against High-Stakes Testing. He spent the entirety of the last six and three quarters years on his KNEES, kowtowing to the CorpoRat deformers, charterizers, privatizers, test monkeys and the likes of Broad, Gates and Pearson. He named another careerist, corpoRat mediocrity–John King, formerly of the New York State regents–to replace Duncan for the last year. Does ANYBODY really think ANYTHING is going to change? I’ve always been flummoxed by Barak Obama’s illogical stance on education. For a man who originally wrote so tellingly about our socially systemic abuse of children “living in the shadows,” how then did he march into executive office and start vehemently leading the way in demonizing teachers and closing schools? Where oh where did his initial logic GO?